With collaboration between Desert Research Institute's (DRI) Division of Hydrologic Science, WRCC (Western Regional Climate Center), Nevada State Engineer's Office, and U.S. Bureau of Reclamation, DRI has developed the Nevada Integrated Climate and Evapotranspiration Network, NICE Net, which is a weather station network measuring weather variables to assess climate and reference evapotranspiration across the state of Nevada. The focus of the NICE Net is to measure and provide climate data that are derived from agricultural areas of Nevada for estimating irrigation water requirements. Currently, NICE Net consists of 18 agricultural weather station located throughout the state of Nevada (see map). With the exception of NICE Net stations, almost all weather stations in Nevada are located in dry, non-irrigated environments. The lack of water around the weather stations causes the air temperatures to be elevated and the humidity levels to be reduced when compared to the climate surrounding irrigated lands. This dry land aridity causes the computed reference evapotranspiration and estimated crop water demand to be in error by as much as 30% when compared to estimates derived from well irrigated climate data. 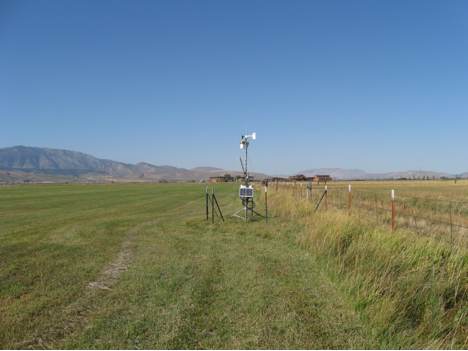 Several federal, state, and local agencies across the western U.S. have recognized this fact and have developed their own irrigated agricultural weather networks, such as the AgriMet, AZMET, CoAgMet, AgWeatherNet, and CIMIS networks. 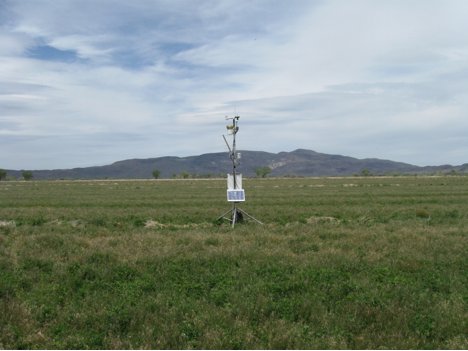 The NICE Net is the first weather station network focused on measuring and reporting climate derived in irrigated environments in Nevada. Currently, NICE Net consists of 18 agricultural weather station located throughout the state of Nevada (see map). Two of the stations Lovelock and Moapa are operated by U.S. Department of Agriculture and Southern Nevada Water Authority, respectively. The NICE Net collects and stores data with sensors from various manufactures (see sensor equipment link) and Campbell Scientific CR-1000 data loggers. The NICE Net is powered by 12v batteries and charged by solar panels. Data transmission from the NICE Net stations to the WRCC is accomplished through the Geostationary Operational Environmental Satellite GOES satellites. Each station transmits once an hour. Types of data collected at each station include solar radiation, air temperature, relative humidity, windspeed, precipitation, barometric pressure, soil temperature, and soil moisture. Data products provided include hourly, daily, and monthly time series of measured climate, and computed variables such as dew point temperature, reference ET, heating, cooling, and growing degree days, wind chill and heat index, time series graphs, wind rose climatologies, wind stability, hourly frequency distributions, and national weather service 7 day forecasts. Info on the background and calculations of these variables can be found on the calculation info page.